A reader recently took the time to write a great letter about his love of Old West history, specifically articles about the lawmen of that period. His name is Eric Walker and he is a veteran law enforcement officer in one of America's biggest cities today. And to answer the question that someone will surely write to ask, he is not a desk officer. Fact is, in his 18 years of service, he has worked the streets the whole time. And what's even more inspirational, he wants to keep doing so until he retires. Since we all find motivation where we can, he wrote to say that he finds "comfort and encouragement" when he reads about the men who did his job back in the Old West, specifically in Texas, New Mexico, and Arizona. As with any great American lawman, he downplays his own tough job and instead wrote saying how, "Those guys had it a lot tougher than I do and I always find strength reading about what they had to face." Dear Lord, where do we find such great Americans to do such thankless work? Well, Officer Eric Walker, this story about an intrepid lawman is for you and the officers out there who work the streets and keep America safe from outlaws and thugs, hoodlums, and murdering punks making excuses for what they do. This story is not about a lawman from Texas or New Mexico or Arizona, but from California. I love real Old West history, American history, unbiased history. We know that Wyatt Earp was a horse thief, a pimp, a bragger, and a con artist. At the end of his life he was known to tell fanciful tales of the West to actor friends. People that he befriended in Hollywood when film makers were romanticizing about the West. Wild Bill Hickok was a back shooter who killed 3 unarmed men. And since John Wesley Hardin's imaginative tale of drawing down on Wild Bill was not witnessed by anyone, I don't believe it ever happened. The reason that I bring these things up is that I truly believe that historians who are not unbiased do us all a disservice. They seem to perpetuate falsehoods and myths. Yet, the real story behind most of these people is much more fascinating. Here's the story of John Hicks Adams. He was a lawman who's life was just that way, much more fascinating than more legends. 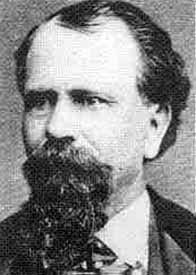 John Hicks Adams was a 49er during the California Gold Rush, He was Sheriff of Santa Clara County between February 6, 1864 and 1870, then again between 1871 and 1875. He was also Deputy United States Marshal for the Arizona Territory in 1878. And indeed, it is a fact that he was noted gunfighter in his time. On June 13, 1820, John Hicks Adams Jr. was born in Edwardsville, Illinois. Since his father, John Adams Sr. was elected Sheriff of Madison County in 1838, it is no real surprise that John Jr. was appointed Deputy Sheriff. As with others, law enforcement ran in his blood. Young John Hicks Adams' first duties as a lawman included collecting taxes and taking care of court business. Remember, back in the day, a County Sheriff was paid anywhere from 10 to 12% of the taxes they collected. From what I gather, that fact is the reason that Wyatt Earp ran for County Sheriff as soon as he got to Tombstone. Unlike the movie Tombstone, when Earp got to Tombstone, fact is he was not retired from anything. Fortunately for law enforcement, John Hicks Adams was the real deal and nothing like the real Wyatt Earp. From everything that I've read on John Hicks Adams, you'd never hear about him stealing school funds or getting arrested for being a pimp and con artist like Earp -- who was also originally from Illinois. In December of 1841, John Hicks Adams married Mathilda Pomeroy. Their first child, May Hanna was born one year later on December 21, 1842. In May of 1847, during the Mexican American War, John Hicks Adams left home to do his patriotic duty and joined Company "J" 5th Regiment of the Illinois Volunteers. During the march south to Mexico, the commander of his company, Captain Niles, died and Adams was given the responsibility of command after being promoted to Captain of Company "J". He stayed a Captain throughout his almost two years of active duty while serving the majority of his time in the Army in the Southwest fighting Indians. Captain Adams was discharged from the Army on October 12th, 1848. Then when word spread East that gold had been discovered in California, he went across country and in August of 1849 arrived in Hangtown. After the discovery of gold in nearby Coloma, California, by James W. Marshall in 1848, the discovery sparked the California Gold Rush, the small town of "Dry Diggin's" came about. It was named Dry Diggin's after the manner in which the miners moved cartloads of dry soil to running water to separate the gold from the soil. Later in 1849, the town earned its most common historical name, "Hangtown" because of the numerous hangings that took place there. The name "Hangtown" stuck until 1850 when the temperance league and a few local churches had begun to request that a more friendly name be used. The name was not changed until 1854 when the City of Placerville was incorporated. At its incorporation, Placerville was the third largest town in California at the time. The El Dorado County seat was then moved from Coloma to Placerville in 1857, because the town was a central hub for the Mother Lode region's mining operations up in those parts. The reason I say "up there" is because Jackson which is 32 miles south is a hub for the area of the Mother Lode near I live. Captain Adams stayed in the Hangtown area, and was part of the placer miners until he returned to Illinois to retrieve his family in September of 1851. Back in those days, travel was slow and tough. It took him a while to return. Finally a year later in the spring of 1852, he and his family started for California. They settled in Georgetown, which is just northwest of Hangtown. Once There, Captain Adams started mining. Then, for some unknown reason, he uprooted his family and started a farm near Gilroy in 1853. The great farm country of Gilroy, California is about 190 miles or so Southwest of Hangtown. A few years after arriving, Adams started his political career by running for and winning the office of County Supervisor for Gilroy and Almaden Township in the September election of 1861. Then in 1863, Captain Adams ran for Sheriff and beat out the acting Sheriff William Aram by more than 500 votes. That special election was held after the previous County Sheriff died and somebody was needed to finish his term. Of course, the Civil War started in 1861 and was ranging in 1864 when a band of Confederate partisans, an outlaw gang known as "Ingram's Partisan Rangers," robbed two stage coaches in the Bullion Bend Robbery near Placerville. What a lot of folks might not realize is that late in the war, local secessionist sympathizers in California made attempts to seize gold and silver for the Confederacy. At least, that's what they claimed they were doing. A great many people at the time saw though Confederates as nothing more than opportunists, outlaws, highwaymen, and killers. Captain Rufus Henry Ingram, a ruthless outlaw who served with Quantrill's Raiders back East, arrived in Santa Clara County with Tom Poole who served with J. M. Chapman. They organized local Knights of the Golden Circle and commanded them in what became known as Captain Ingram's Partisan Rangers. While they claimed to be serving the South, they were in reality just serving themselves. In the Bullion Bend Robbery, they robbed two stagecoaches near Placerville. In the process of their stealing silver and gold, they left a letter explaining they were not simply bandits. Instead, they claimed that their outlaw act was supposedly a planned out military operation to raise funds for the Confederacy. They were full of themselves. Just excuses by badmen. The value of the loot was enormous, especially by 1864 standards. The $52,000 they stole would be close to a half-Million dollars today. And yes, believe it or not, Ingram issued "receipts" to the express drivers in the name of the Confederates States of America. During the pursuit of those Southern "patriots", Deputy Sheriff Staples of El Dorado County was gunned down. It happened when he surprised the band at a rooming house the next day. Information about the killing of Sheriff Staples was relayed to Sheriff Adams along with the information that the Confederates were in a shack near Almaden near Gilroy. Sheriff Adams and a posse of Deputies surrounded the shack, and demanded their surrender. The Confederate partisans did not obey and instead opened fire while trying to escape. It is said that the shoot-out was like one we see in a Western movie. That is except for the fact that black-powder smoke filled the area with a thick fog. The gang and the posse engaged in a firefight that went on for a while before finally all of the Confederates were either captured or killed during the gun fight. The only one of "Ingram's Partisan Rangers" that was believed to have escaped was Captain Ingram who used the haze of gunfire to desert his men and leave them to die. Sheriff Adams himself took a bullet. Yes, he was wounded with an honest to God "flesh wound" when a bullet struck his pocket watch and glanced into his ribs. The wound did not stop him from pursuing another gang of "Confederate partisans" known as the Mason Henry Gang. Again it took place in early 1864, Confederate sympathizer Judge George Gordon Belt, a rancher and former alcalde in Stockton, organized a group of Confederate partisans which included John Mason and "Jim Henry." He sent them out to recruit more men and pillage the property of Union supporters in the area. For the next two years the Mason Henry Gang, as they became known, posed as Confederate partisan rangers. Of course, in reality they were just thugs and outlaws. They committed armed robberies, thefts and murders in Southern San Joaquin Valley, Santa Cruz County, Monterey County, Santa Clara County, and in counties of Southern California, all in the name of the Confederacy. All while knowing that the loot they stole was theirs for the keeping if they were able to stay alive. It is interesting to note that no captured gold was ever sent to the Confederacy by those who called themselves Southern patriots in California. Fact is, people talk about Quantrill's Raiders, but the Confederates partisans marauding in California were nothing but a vicious gang of outlaws, committing robberies, thefts and murders in the Southern San Joaquin Valley, Santa Cruz County, Monterey County and Santa Clara County. They preyed on stagecoaches, ranchers, farmers, travelers, and especially those who were known Union supporters. They did not steal from the U.S. government. They did not steal from Federal forces or installations, or any official representatives of the Union. They stole and robbed from innocent hard working folks, and killed those who did not cooperate. Sheriff Adams pursued the gang with the help of two companies of Native California Volunteer Cavalry from Camp Low. No one could locate their hideout at Loma Prieta until a posse of nine soldiers and five citizens led by Sheriff Adams searched the area around the Panoche Valley in June of 1865. That area is what is now known as part of San Benito County. Just as with modern day police work, while in search of the gang, the posse received a reliable tip that gang members were planning a raid on the ranches there. Just like what takes place with organized crime today, the gang set up a system of spies to warn them if the law was near. So when Sheriff Adams arrived at Panoche Valley, Confederates Mason and Henry were already retreating towards Corralitos. Mason and Henry were sensationalized by the media as "The Copperhead Murderers." They had the habit of not only committing robberies but also murdering people just for merely voicing support for the Union. Sheriff Adams was close to getting the gang on several occasions, but they always managed to slip away. This fact did not stop the intrepid Sheriff, and his relentless pursuit paid off by forcing the gang to leave and head to Southern California. There in Southern California, Henry was killed by the San Bernardino County Sheriff in September of 1865. Mason was killed by a Bounty Hunter near Fort Tejon in 1866. Yes, he was killed by a Bounty Hunter looking to make a pretty handsome dollar off of bringing in Mason's head. While in office Sheriff Adams acquired a good reputation as a lawman and a gunfighter. He was known for his honesty and diligence to duty. He ran successfully for re-election in 1865 and 1867. He became the first Sheriff in Santa Clara County to be elected to three consecutive terms. Retiring for a couple of years in 1870, he again decided to run for Sheriff in 1871 and 1873. He won both terms. Although Sheriff John Hicks Adams didn't personally capture the murderous highwayman Tiburcio Vasquez, it was Adams detective skills that brought him to justice. Fact is, Sheriff Adams was a good detective and it was his information that led to Vasquez's arrest and capture in Los Angeles. Tiburcio Vasquez was hung before a large crowd of men, women and children in the yard of the Santa Clara County Jail. All just proving that intelligent police work, even while forensic evidence gathering was in it's infancy, pays off. In 1875, Sheriff Adams lost an election and finished his last term in March 1876. Then, after tending to his farm for a couple of year, John Hicks Adams left the San Jose area to mine gold in Arizona on January 24, 1878. In late August of that same year, Adams was appointed Deputy United States Marshal for the Arizona Territory. Ten days after his appointment, on September 2nd, 1878, he and a fellow officer Cornelius Finley were ambushed by five Mexican bandits between the Washington Mine and Tucson. It is said that Marshal Adams put up a fight. In fact, despite being shot, he appeared to have been beaten to death with clubs and rocks. It is ironic really, that the murderers were caught in Mexico but the Mexican officials there at the time actually refused to extradite them to the United States for the prosecution of the murders. I guess nothing has changed along the border in 137 years, lawmen still do the job and get little cooperation from Mexican officials. Too bad Mexican officials along the border have a long tradition of being as corrupt as the day is long, yet they would certainly benefit from turning murderers over. As for John Hicks Adams? He was the real deal. And frankly, I really wish real lawmen like Adams would get the respect and notoriety that they deserve. He really is one of the unsung law enforcement heroes in the days when men loaded their Winchesters, loaded six instead of just five in their Colts, and saddled up with their posse for the long haul. It was just all part of the job, it was what they did. There was no questioning their steadfast dedication to duty, and they didn't debate the wrongs that put others on the run. They grabbed a box or two of extra shells, two full canteens, and stuck hardtack along with a bit of coffee in their saddlebags next to their irons. They set out knowing full well that if their horses stayed afoot and held up under a lot of wet blankets, that not even shot and shell, rain and wind and blazing sun, would stop them as they rode down outlaws in the name of justice. He was buried in Oak Hill Memorial Park in San Jose, which is in Santa Clara County, California. The county he served for so many years. It's said that John Hicks Adams is considered Santa Clara County's most famous lawman. Because that's the case, Santa Clara County Sheriff's Department has created the John Hicks Adams Room at their headquarters. The room houses a historic collection of uniforms, firearms, badges, equipment, newspapers, and other memorabilia of that Sheriff's Department. 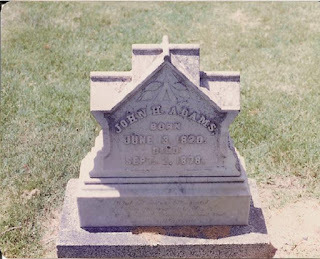 John Hicks Adams was a tough hombre. He was the real deal who should be remembered. And frankly, that's just the way I see it. Awesome story! Thank you!!!! Keep 'em coming.